This morning, we woke up around 7:00AM and went to a restaurant called Zigzag. At Zigzag we ate delicious breakfast foods like French toast, muffins, and English breakfast. At breakfast, we talked about how we are going to explain our experience to others back home. We all have struggled to put into words what this trip means to us because of how impactful it has been. We were led by the current missionaries in this session on re-entering the United States. We discussed what is okay and not okay to post on social media, as well as ways to not overwhelm friends and family with everything that we have learned. We talked about how to stay connected with the individuals of the organization that hosted us and how to give back to it. At the end of breakfast, we said our goodbyes, and we were sad to leave yet were excited to head back home to tell others about our experience here in Zambia. During this trip, we learned how big the global church is. For a lot of us, we did not realize the full extent of God’s work around the world. This trip allowed us to see that although we come from different backgrounds, we still worship the same God. At first coming to Africa, most of us focused on the physical poverty of the area, but throughout our time we learned that these are their daily lives, and they are very rich spiritually and in other things. This trip has changed all of our lives because now we know how much God loves all of his children whether they are in the U.S or Zambia, and we now want to continue to grow deeper in our faith. This trip has brought up 14 brothers and sisters that will continue to walk towards Jesus together in any way that He calls us. Several people have considered different ways that they can stay connected from the experience that we had, whether that is to give back financially to the organization, apply for the summer internship that Poetice hosts, or to consider the missionary field as a career option in the future. Over the last week, not only did we grow closer with each other and Jesus, we also grew closer with all of the Poetice staff. They helped us understand the love of God in the community and spoke God’s truth to us and to the community members we worked with. These are people that we will never forget and are people that we will continue to stay connected with. Thank you for everyone following our daily blogs and the continued prayers of support. We are now headed back to the United States and are excited to share the fire that God has started in all of our hearts with you all. We cannot emphasize enough how thankful we are for this experience and how blessed we are to walk along side Jesus. So many emotions ran through our minds as we woke up in Choma for the very last time. We’ve experienced so many wonderful things this week and it was hard to say good-bye. We celebrated our last meal together with the EMIZ staff and our team at 6:30 am. Then around 7:00-ish we packed up the bus and began our journey to Livingstone. The bus ride took about three hours and many people slept on the way there. Once we arrived in Livingstone, we dropped our luggage off at the Emert and Howell families’ homes. These two mission families partner with Poetice in Livingston and we cannot thank them enough for their hospitality and support. From there, we headed to Victoria Falls. The falls were a short drive from downtown and we were all very excited to see them. We had an hour and a half to explore the Zambian side of the falls. The falls were still beautiful even in the dry season. We were completely in awe by all the beauty that God created on this Earth. We were also shocked to learn that there were as many baboons near the falls as there are squirrels at Hope College. After the falls, we got to go back to the EMIZ base in Livingstone for a lunch of PB and J’s courtesy of Tena and Kyle (mom and dad of the trip). After lunch we had to say goodbye to Blessing and Sande (two of the Choma staff we got to know throughout the week) before heading to the market. The market was an experience in itself. We bartered with all of the vendors and bought some souvenirs to bring home with us to remember the trip. Then it was time for the game drive (African for safari). We got to see so many animals including; impalas, buffalos, zebras, baby zebras, birds like Zazu from the Lion King, monkeys, warthogs, a hippo, adult and baby elephants, some more baboons, giraffes, a wildebeest, and a crocodile. At one point, we were worried that we weren’t going to be able to find any elephants or giraffes, but we ended up getting stuck between two elephants and two giraffes on the way out of the game drive. A lot of our week has focused on seeing God through people, but today we really got to focus on seeing God in nature and it was a great experience. After the game drive we headed back to the Howells’ home for dinner and ate homemade chili with rice, and incredible cornbread. After dinner, we went out to do our final team debrief around a campfire. We focused on the ways we saw God this week and how he revealed himself to us as we were using all of our individual gifts to serve him. We also reflected on who had the most impact on us and how our eyes were opened to the global church. This was a very good time for reflection. We have been so blessed with this opportunity, and from this, we have realized how much this experience has impacted our faith and us. Tomorrow we are headed home for the States and we can’t wait to begin to share our stories with our friends and families. We have finally arrived in Chicago and we are in route to Hope! We have had an incredible trip and we were blessed to receive the opportunity to share God’s love to Costa Rica. This trip wouldn’t be possible if it weren’t for Sawyer’s sponsorship. 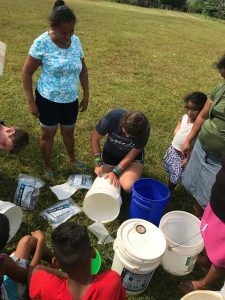 Sawyer gave us the opportunity to give the Costa Ricans clean water and help prevent communicable diseases. We also would like to give a big thank you to Push The Rock! They gave us the opportunity to grow as a group and individually. We will miss Costa Rica very much! We’d also like to extend a thank you to those of you who have been sharing in our journey through this blog and through prayer. This morning we woke with heavy hearts knowing that it would be our last day with our soccer children. We began our morning with worship and devotions and after we welcomed the kids for the last day with games galore. Once everyone was here, we went inside the hall to hear testimonies from Chris and EJ. Chris talked about growing up and how his life has changed since he has found God. EJ shared her favorite verse from the Bible which was 1 Peter 5:10 and explained that God has the power to heal even when you go through hard times. He will give you chance at new life. Once the testimonies were finished, we broke into small groups to go play new games with the kids. Today, we had clothespin tag, classic volleyball, track and field, and ultimate Frisbee once again. They showed improvement to the old games and quickly picked up on the new ones. Looking around, there was nothing but pure happiness and love throughout the morning. After hours of playing both new and old sports, we gathered back into the hall to hear from Caroline and Coach V about the word of God. They both talked about perseverance and how important it is in life and sports to pursue God. They read scripture from Romans 5: 1-5 to help explain their message. Later in the afternoon, we broke into small groups to teach the children about hygiene, strength training, how to warm up, and leadership. Kyle, Maya, and Jenna led the hygiene group where they reminded the kids of basic hygiene and how to keep their bodies healthy. Alli, Sara, and Tena were in the leadership group where they talked to the kids about who they look up to and why and talked about how they should look up to Jesus because He is our leader. Jager, Eddie, and Britta were in the strength and conditioning group where they did a lot of plyometric exercises and fun games to stress the importance of exercise. Haley, EJ, and Brian led dynamic warm ups where they different types of dynamic stretches to show the importance of stretching before playing sports. All the kids seemed to enjoy the small groups today, learned a lot, and asked great questions. We went back into the hall to sing Father Abraham in front of everyone before we were released for lunch and team pictures. As some teams went out for pictures, others stayed in for a quick dance party with live African drums. For lunch, we had a classic PB&J sandwich and had fellowship over the meal with the little ones. The games continued after lunch for about an hour before everyone gathered into the hall for one last time. The whole staff and kids said thank you with loud cheering and whistling which made our team feel so welcomed and loved. Abby mentioned that we will always have a family here in Choma and we are welcome back anytime. We thanked the kids for being so awesome this week with handmade bracelets, Hope stickers, and candy!! We also got into groups of 4 with some of the kids and prayed for whatever was heavy on their hearts. Once the commotion died down, some of us got ready to go into the community for home visits and some stayed in their athletic wear for community kids to come to the base for Kids Club. We went into Armor’s kids family homes where we asked questions to learn more about their culture and every day life. We also talked about the word of God and gave them any advice we could offer. We ended each home visit in prayer with everyone hand-in-hand. When we arrived back to the base, there were several community children there for Kids Club. We ended our night by playing games with them and said our heartbreaking goodbyes with so much love and several hugs all around. For dinner we had nchima!!! We were all excited and we thank Mama B, Mama D, and Mumba for cooking our favorite Zambian meal on our last day. To top the night off we all gathered to thank the staff here at EMIZ and Poetice for their wonderful hospitality and welcoming us into the family. We gave them their very own SEED shirt as a way to always remember us. Last thing on the agenda for the night was debrief. We all shared our God moments for the day, which everyone looks forward to every night. We all felt overwhelmed with gratitude for the week that we had together and the experiences we’ve encountered. We joined together, hand-in-hand with an emotional prayer for anyone to jump in when they felt the need to. Overall, it was a beautiful last day to spend in Choma. We want to thank everyone who has made this trip possible and we all look forward to see what God has planned for us when we go back to the States! We started the day with devotions and worship after breakfast. Felix, our worship leader for the morning, encouraged us to pray for each other during the songs that we were singing. A lot of us were moved and felt the Holy Spirit during the morning. After devotions, the Armour’s kids came for another talk from Caroline and Coach V. Today, their message was from 1 Corinthians 9:24-27, which talks about dedicating your bodies to compete and serve in a way that will glorify the Lord. Caroline talked about running the race with perseverance so that we can have eternity with Jesus Christ. Jager and Blessing also shared their testimonies with the group, which was inspiring for all of us. We then separated into stations with the kids. We introduced some new activities and sports, including American football, capture the flag, ultimate Frisbee, and their favorite: volleyball. After the sports stations, Kyle, Jenna, EJ, and Brian did some very enthusiastic cheers with the kiddos (ex. The banana cheer). We then split up into 4 different session groups led by Team Z. The sessions today were: speed and agility, sportsmanship, nutrition, and yoga. All of the kids paid attention, asked good questions, and seemed to enjoy each of the stations. We were all super pooped after a long and eventful morning. We took a short break to put some food in our tummies and then we were off and running for the rest of the afternoon. After lunch, Abby split up the kids up into groups. Some of us did home visits with some of the kids from Armour’s and some of us stayed back to do more water filter demonstrations. The rest of the kids went to soccer practice. We were assigned do home visits with two brothers from the Armour’s boys teams. After walking to their home, we were greeted by their step-mother and some other relatives. At the small home that we were visiting, there were 19 people living there. The mother that we had the chance to talk to was raising the boys and their siblings because both of their parents had passed away. Not only was she taking care of the brothers and their 7 others siblings, but she had 6 children of her own. There was only 1 person in the family who was bringing in income for the family. It is very hard for them to feed their family – most of the time they only eat one meal a day. When asked about her life, the mother seemed helpless. She asked that we pray for more years for her so that she may provide for her children. We were all struck by her selflessness, kindness, and strength. However, after taking a glimpse into her life, we were impressed, but also frustrated because we felt like we couldn’t do anything. After the home visits, we had some down time as a group. Most of us focused on making friendship bracelets for all of the Armour’s kids (80+ kiddos). Others focused on improving their volleyball skills (Coach V). After dinner we debriefed as a group. This is our favorite part of the day because we all share how we saw God throughout the day and how we were challenged. It’s so awesome to see how friendships are growing and how God is working in each of our lives. Today we focused on how our stories, both before and after this trip, can be an influence to others. We were also encouraged by what Abby had to say about our home visit. She said that even though we feel helpless, “what we have in us is the most helpful.” Food is a short-term need but the gospel is a long-term aid. The fact that God is pushing this on our hearts shows that there is hope for change. What we feel as helplessness is actually hopefulness from God. We only have one more full day in Choma but are so excited to see what God has in store for us. Life here feels so real and the idea of going back to school in a week sounds superficial. It’s hard to see the necessity of school when we have seen people live this way in their daily lives. We feel like we are needed here. Today was a day filled with many lasts of the trip. We started our day bright and early at a 6:00am and left Los Chiles. We had a full day ahead of us that consisted of adventures like zip lining, bus rides, and hot springs. As we filled our anxious bodies with food served on seaweed we prepared our minds for a canopy tour over the jungle. We strapped up, and we were on our way! There were twelve different zip lines including a Tarzan swing, crazy horse, and superman across the valley. We got to see God’s beautiful natural creation. Our guides cracked many jokes about how tall Cody was, Jdawgs screaming, and Sydney and Luke’s fear of snakes. After surviving this crazy new experience the team bonded over a long bus ride to Baldi Hot Springs. We enjoyed the time and fellowship with each other in the hot springs and water slides at the base of Arenal Volcano. On the bus ride home, Melinda shared with us about how the Israelites created a memorial of 12 stones to remind them of God’s great works among them (see Joshua chp. 4). Likewise, we each reflected on the most impactful experiences and people we encountered during the trip and made our own monument out of Costa Rican colones (their currency). We discussed best practices for transitioning back to life in the United States and look forward to sharing about and applying our experiences, shared and individual. Coach Kust blessed us with a beautiful affirmation she wrote for us, and we finished our team time with prayer. Thank you for following along on this blog and for your prayerful support of this team and our trip. We anticipate continued blessing and safety as we travel tomorrow. This morning we woke up early, watched the sunrise, ate breakfast, and were supposed to get on the bus to leave for the village of Macha at 6:45. Push the Rock is a sports based ministry present in the community there. Last year Caroline had the opportunity of working with the Messiah College student athletes in Macha and today we partnered with them in their sports ministry. However, the bus was running on Africa time again so we actually left at 9:05. While we were waiting for the bus, the members of our team either made string bracelets or played sports with the U10 and U12 Armour’s soccer teams who were coming with us to Macha. After a long and bumpy ride we arrived in Macha and began our day with Push the Rock. We split up and partnered with Messiah College student athletes serving at the base in Macha that week. We worked on different sports stations, which consisted of games such as lacrosse, tug of war, and volleyball. After the session we continued to play with the kids while our Armour’s kids got ready to scrimmage the players from Macha. During the scrimmage our team and Messiah’s students continued to have fun with local kids and adults. We danced, played games such as netball, and Coach V taught the kids how to play softball. After the scrimmages, we had the opportunity to share another Zambian meal, which included Nchima. Post lunch, we played volleyball against the Messiah College athletes. We won two of the three games in the match, and it was fun for us to come together to work as a whole sports team. We ended our time in Macha with worship with the Push the Rock staff, Messiah Students, and the children of Macha. Elam spoke about how God loves each and every one of His children the same, no matter the differences between us, and He loves us so much. He also made the point that it is no accident that we all were gathered together today. God had planned all of our interactions far before today and knew that we would all cross paths to love on each other. Two Messiah students sang songs for the children to listen to and spend time with God. We want to give a special thanks to Push the Rock and Messiah College for letting us be a part of your mission in Zambia. Sadly, it was then time to say goodbye to our new friends, but we got to head back to Choma for a delicious meal waiting for us (thanks Mumba!). We spent the rest of the evening in discussion and fellowship with our team and the Poetice/EMIZ staff. It is always wonderful to hear the different God sightings and highlights of the day! We woke up on this crisp Sunday morning with breakfast and went to church at Bread of Life in Choma. The service was very memorable and spirited and everyone seemed to enjoy the new atmosphere. During the service, the pastor preached a powerful message how the God the people of Zambia serve is the same God that is worshiped around the world. We all thought that this was very relevant to our whole mission of spreading God’s word. At the end of the service, the pastor asked if there were any visitors in the service today. Although we stand out, we stood up in our seats and were welcomed by the congregation. They then ushered us into a separate room and gave us food, talked with us, and extended us an extra warm welcome. After service, we had the opportunity to explore the downtown market. The market was comprised of numerous small wooden huts with various items to sell such as food, clothing, electronics, etc. The main attraction for everyone was the chitenge shop. A chitenge is a traditional wrap that women wear around their waist similar to a skirt. They come in a variety of colors, patterns, and fabrics. We thought of them as a way to connect with the culture, a reminder of our amazing trip we have had so far, and a cool fashion statement when we get back to campus. When we got back to base, the rival volleyball games continued as a few more victims were hit in the face. Although this trip has been such a blessing in itself, it was great to have some down time and enjoy the Sabath because we have been very busy these past couple days. It was another great way to connect with each other. For lunch, we had a classic American grilled cheese with veggies topped with some Coca Cola. Once everyone finished lunch, we prepared for the afternoon as the families from town were coming to the base to learn how to assemble the water filters. When the dirty water was put through the filter and came out clean, the faces on the parents were overjoyed. We then broke into small groups and let the parents assemble the filters on their own with the help of a member from Team Z. Each family that attended went home with a water filter that they will be able to use for a lifetime. Not only does the water filter prevent water borne illness and disease, it also serves as a friendly reminder that God cleanses us of our sins! Everyone was so thankful for what we were doing to help the community and the different families. Later Sunday night we went to the soccer pitch to support the amateur men’s team as they battled for the first place seed. While some were cheering for our guys, others were spending time with the younger kids in the community playing crowd favorites such as: duck-duck goose, jump the river, ring around the rosy, clapping games and several others. Although the guys had a tough loss of 0-2, they brought their best effort and we couldn’t be more proud of them! To finish off the night, we ate spaghetti for dinner, cleaned up the base, played cards, and had our debriefing session. One point that Coach V talked about was how Sawyer has been very generous with their equipment and made it possible for us to come here and change the lives of many. She hoped that one day we can take what we have learned with our time here and can apply it in our future lives to keep changing the world for the better. #WordsOfWisdomFromCoachV. In our debrief, everyone testified to feeling God’s presence these past couple days and we all just look forward to see what else He has in store for us and in what ways He will bless us and the community! We didn’t sleep in today!! The rooster from Coto Brus called his cousin and told him we would be here. We left home base around 7am for a 30 minute bus ride into Los Chiles. The morning began with a sports clinic. The kids came from all over to play a mixture of sports that included: Follow the leader, Disk Golf, Catch, and Cabezas y Manos. Some of these were extra fun because the field we were in was full of water due to an early morning rain. The first clinic ended with Matt and Frankie sharing their testimonies with the children. All this was done before 9:30am. Shortly following the first clinic the second one began. Many children came eager to play despite the heat and humidity. The second clinic consisted of: Dodgeball, Wiffle ball, and Lacrosse (lead by our fearless Juliana). The children really enjoyed learning these new games. After lunch we returned to the field where the kids and their families came back with buckets ready to receive water filters. The water filter instruction and demonstration was led by our very own Melinda and included a gospel message. After the demonstration each team member was able to assemble 5-6 water filters for the people of the village. It was great to see their smiling faces as they walked away with their new filters. We made filters for 65 families! This was incredibly cool, yet humbling to witness their joy over something we often take for granted. And when we get home we will have to make sure to send more water filters to this community because there are still families in need. Thankfully the Push The Rock staff visits the local ministry here often. After the final filter was assembled, we were done for the day. To show her appreciation, a women named Esperanza (Hope) made us Arepas (similar to the best pancakes you have ever had) and brought us a refreshing cold drink. On the bus ride back from Los Chiles we stopped at an Iguana bridge. This was quite literally a bridge with Iguana covering it. Our dinner was wonderful as always. After dinner we gathered together, sang some worship songs, and continued our study of 1 John. The night finally came to a close with one last water filter assembly for a local futbol coach who works with the ministry we are partnering with. Tomorrow we return to San Jose and will get to experience some of the beauty in the area of Arenal Volcano along the way. We thank you for the continued support and prayers as our wonderful journey comes to a close. Buenos Noches!! We slept in today! For the first time all trip, we slept in past 6 am to a much later 8 am (get at us 8 am classes). We got all dolled up and took a lovely stroll down the road to a local bakery where we proceeded to fill our bags with an abundance of sugar and carbs. While slightly reminiscent of Good Time Donuts, it was fully lit and lacked our favorite donut man. Nonetheless, we were all satisfied (except Matt who couldn’t decide whether or not he liked his pastry). Luke would like to add that he personally enjoyed a fresh home brew of AMCA coffee. After carbo-loading, we loaded up the car. As we’re sure many of you are on the edge of your seats in anticipation, the rumors are true. El Toaster (our bus) has returned!! It might just be an urban legend, but some say that they saw Heather Randall cry when we heard that it was again our trusty steed for the trip to Los Chiles. Before making our long journey, we attended CED church in San Jose. We loved church! Everyone was so hospitable, and they provided a translator for us during the sermon. The worship songs were interesting to navigate at first, but we quickly caught on to how many of them were the same chapel songs we sing back at Hope, like 10,000 Reasons and Cornerstone. It was so humbling to be a part of international worship like that, knowing that The Lord is above all worship in every language. We think that many of us will look back on this day when we sing those same songs in chapel when we return to campus. The pastor sent us out with a benediction, reminding us of how we were living out the scriptures written in The Great Commission. Though we’ve already used this word to describe our church experience, humbling is truly the best word that can capture the experience. Being a part of the international church was an incredible experience, one that we will all hold in our hearts for years to come. Back on El Toaster, we were ready to conquer the world. The City Mall didn’t know what had hit them when us gringos piled in and promptly hit up Mickey D’s, Pizza Hut, and Taco Bell. Pizza Hut was a bit of a struggle with the language barrier, and most people ended up with a mystery meat on top of their pizza (the most popular vote right now thinks that it was Canadian bacon). Many of us were pleasantly reminded of how nice it is to have a drink with ice in it, a luxury we had not experienced since our last plane ride. After we explored a little bit and sadly learned that Costa Rican Nike costs the same amount as Nike in the US, we headed out and popped back in El Toaster yet again. El Toaster never disappoints. It provided us with A/C, laughter, and safe travels. Favorite memories included hot spot interviews hosted by our very own Matthew Douglas (Douggy Fresh) VanDyken, rainbow spotting, and a quick pit stop at a tourist shop with candy. The interviews stuck out as the fan favorite, including questions such as celebrity crush (male & female), what it feels like to be an All-American Athlete (@Frankie @Sydney), and Hope College CFA (Crush From Afar–which has yet to receive any answers). After what felt like the shortest bus ride yet (3 hours), we arrived at our new home for the next two nights. Los Chiles is about to be quite the aventura–that’s adventure, for you non-Spanish speakers. We’re all about to come back fluent. Look out world. After settling in to our new quarters, we enjoyed a delicious dinner and kicked off team time with some worship–catch us on Spotify, Kust recorded it. We’re getting ready for bed now and are eager to lead two more sports clinics in the morning and a big Sawyer water filter clinic and distribution for families in the community in the afternoon! Buenas noches! P.S. There was a giant frog that Julianna caught in a lacrosse stick. P.P.S. Heather is getting emotional just writing about El Toaster. P.P.P.S. We thought Luke deserved a shoutout here too.